A vertical bento (Japanese lunch box) with nutritiously balanced ingredients, which are custom made into bite sizes for eating on-the-go. The cap works as a cutlery with its 3 point grip, and the bottle’s body is engineered with spring integrated function that allows the food to be within reach. 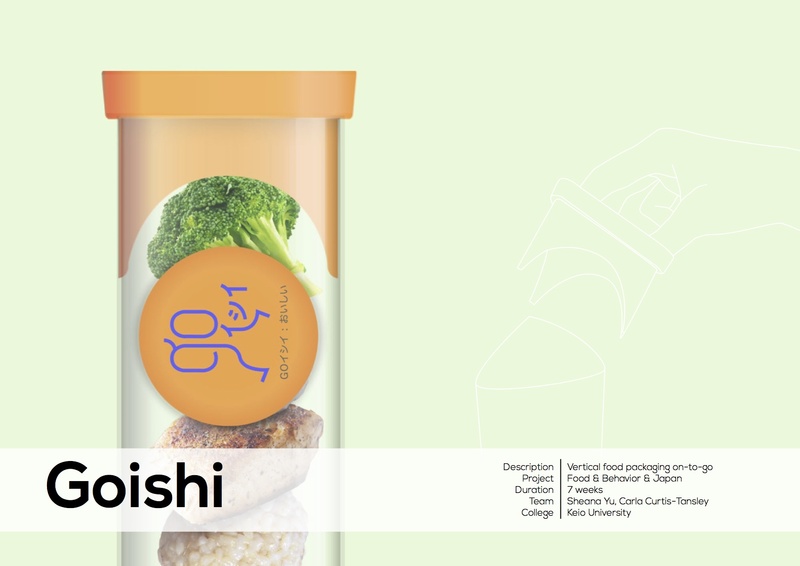 In combination this allows Japanese consumers to eat elegantly and discretely without compromising a balanced diet. In Japan over the past 3 years, convenience stores have reached an average of food retail sales of 5444356 million yen per year. Thus, as a team, we decided to tackle Japanese fast food market. We observed that on the shelf on-the-go food choices are not nutritiously balanced, and some are too salty, some are too protein heavy, so we see an opportunity to provide a healthier option. We observed how Japanese students eat on-the-go, and based on the needs analysed from our observation, we came up with 4 experiments to validate the insights. We asked over 20 Japanese consumers (Age between 17-26) at Hiyoshi Station, locating next to Keio University, to test our ideas and give us feedback.